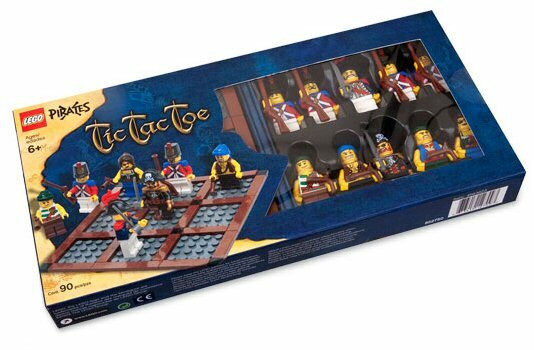 LEGO Pirates Tic Tac Toe - includes 10 minifigures! 1. What do you think of this set? 2. Are you going to buy it? I'd love to, if I can find one! I'm buying a chest of these! 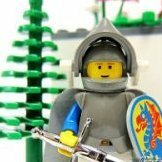 While browsing S@H for the Brickmaster book, I found something more interesting. I say: A bit confusing to play, with all those different figs, but an outstanding minifig pack! I have mixed feelings about these minifig-intensive packs and things like the magnet sets; amazing as they are, I hope they don't damage sales of the actual sets. Captain Blue Hair is the best! Holy MOLEY Gaucomole, son of a megablox!!!!! I wonder how much? I so want like 10 of those! Shouldn't there be 2 more figs? I hope they don't damage sales of the actual sets. This is certainly a great way to disgue a minifigure pack! This is the most generous helping of Pirate themed minifigures ever to be released! Excellent find! You have gotten me feeling so excited about this. This minifig pack is filled with so many great minfigs including the Pirate girl and the admiral. Unlike the Police and Castle tic tae toe, which only have 2 factions of a same kind, having 5 each. This set have so much more. Thanks for finding this, and I sure hope this will be available to us soon. Fantastic! A minifigure set for sure! I have frontpaged this, it's quite amazing. You have done we to act so responsively Captain Zuloo! This looks great, an easy way to get allmost all of the different minifigs, or at least the different torsos (only no admirals daughter and no mermaid (allthough the latter is in the advent calendar). Will this also be available in regular stores in Europe? thanks Cobra for the information. the box art is attractive. the minifigs collection are also very nice. this is the best LEGO tic tac toe i think. It would be a bloomin shame if they didn't release this set in the country of LEGO's origin! There are 10 figures. Lots of soldiers. I would like TLC not to include the admiral/Brickbeard guys in the set. You can have plenty of them when you buy "normal" sets. Compared to the "skeleton-knight" Tic-Tac (and all other similar I know of), it's nice to see this new one with not just two different minifigures. That may also have increased the price a bit. This could be my chance to get the female pirate! I would like TLC not to include the admiral/Brickbeard guys in the set. You can have plenty of them when you buy "normal" sets. Yeah... I agree. But I can still use them to mix-and-match. Well too bad! You're getting the Governor Broadside and Captain Brickbeard minifigures whether you want them or not! However, I do agree with that statement. Just think how ridiculously common Captain Red Beard/Roger and King Kahuka were, and we probably don't want a similiar situation with noteable mini-figures of the new Pirate theme. An admiral! and soldiers all armed with muskets! and captain and wench! this is my dream... <WTF? i see no backpacks on the soldiers, correct me if i'm wrong. Looking around I dicovered there was a 852132 Castle Tic Tac Toe that existed (... or still does?) and a City Police / Inmate Tica Tac Toe... I wish they made an indiana jones one... but the pirate one looks great, it's even better than the castle and city ones! Looks great; honestly all I want is the Pirate wench and all those tiles (and the baseplate could come in handy as well). I'll be picking one up for sure and maybe selling off the other figs since I don't really collect the Pirate line. Woo! I definitely want one of these, thanks for posting Cobra! I for one am more than happy to get more of them for parts.